Brant Florist is Burlington's top wedding flower shop when it comes to Bridal Flowers, Boutonnières, Corsages, Hair Flowers, Wedding Cake Flowers, Wedding Table Centerpieces, Church and Hall Flowers. As one of Ontario's most trusted wedding florists, we have been designing wedding flowers for brides in the Burlington weddings, Oakville weddings, Hamilton weddings and Niagara Falls weddings for over 40 years! We take great pride in helping brides on their special day. We do everything we can to make your wedding flowers everything you imagine. 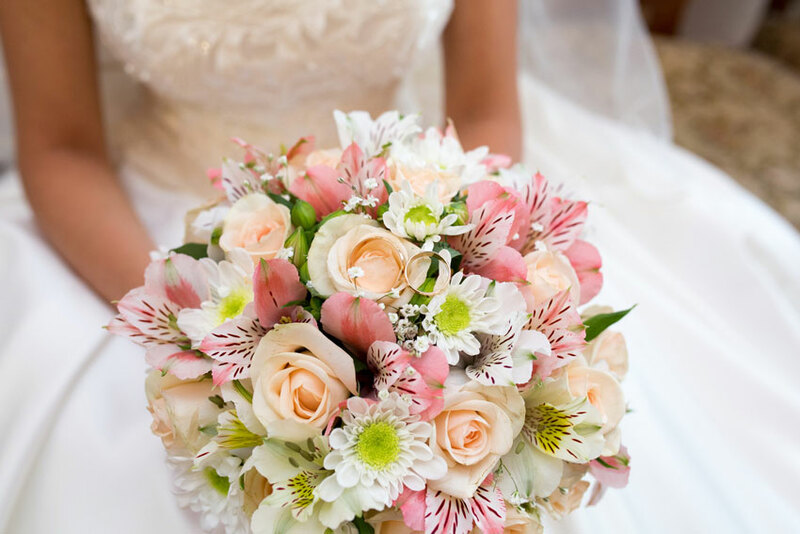 We appreciate that your wedding flowers are a special part of your wedding day and we want them to be perfect for you. We are a full service wedding florist - we do it all - from engagement party flowers, rehearsal dinner flowers to wedding and reception flowers. We have worked with thousands of brides and their families and strive to make your wedding day exceptional and beyond your expectations. Working with other wedding professionals - we service a large part of the Greater Toronto Area and the Golden Horseshoe, and we work at the most popular wedding locations in the area. We custom design all your wedding flowers - corsages to match your wedding colours. Hair flowers to suit your hair and bridal veil, wedding cake flowers to compliment your wedding cake, boutinieres for grooms men. We want your wedding flowers to be as unique as you are. Same with wedding decorations and wedding flowers - wedding flowers for the ceremony, church flowers, pew bows, hoopah, balloons and other wedding ceremony decorations decorations. We design wedding reception flowers that compliment your wedding colours and style. Beautiful and custom designed table centrepieces for every style and budget. Because of the personal nature we do not accept Internet orders for wedding flowers or bridal bouquets. However, we are happy to help you with your wedding flowers. Please phone us at 1-877-545-5535 or email us at inquiries@brantflorist.com for all wedding flower inquiries. We would be pleased to discuss your wedding flower and bridal bouquet plans and ideas. You are also welcome to come into our shop located in Burlington. Because of the time involved we prefer you schedule an appointment by calling or emailing us, and start making your wedding day dreams come true!